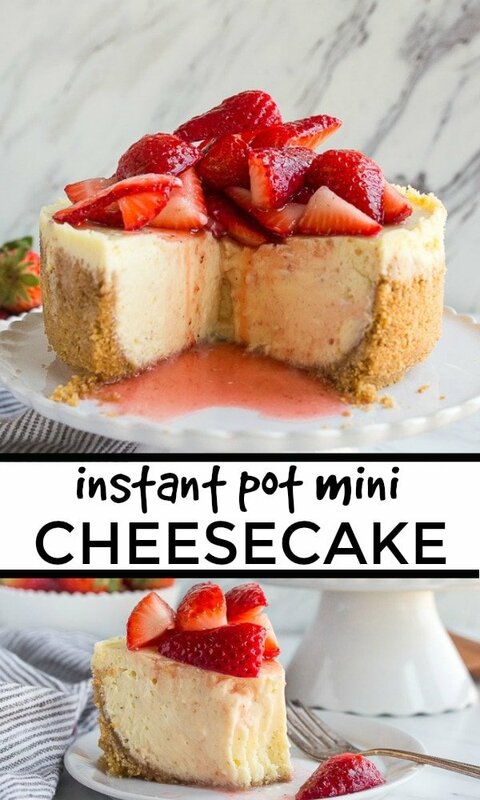 Instant Pot Cheesecake recipe made in the 3 quart instant pot mini! 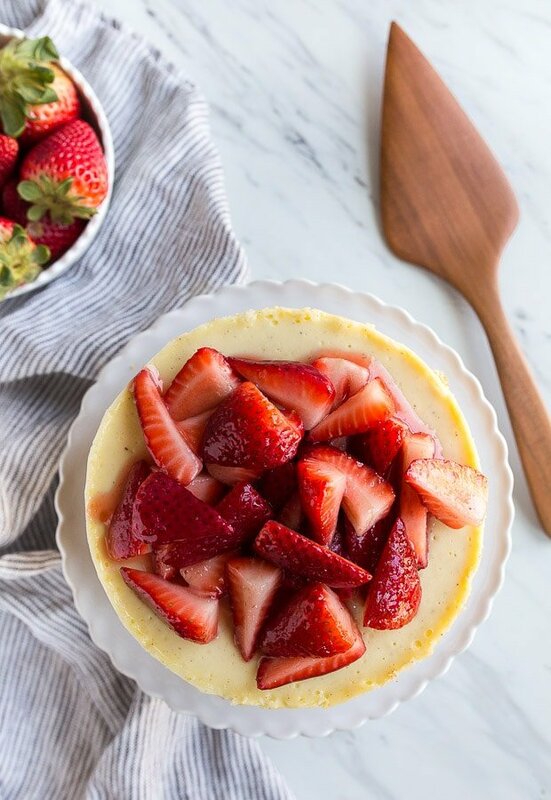 This small 6″ cheesecake is easily made in the pressure cooker. Spring is here, and I promised you more cheesecake recipes! I also promised you more Instant Pot mini recipes, because they’re so easy and effortless! Do you have your mini Instant Pot yet? Now that I’m bringing you dessert recipes, it’s definitely time to invest in one. Here’s the one I use. Before you head out to buy yourself a new Instant Pot, I think we need to do a little Spring cleaning to earn it. Wouldn’t you agree? What’s the current state of your fridge after winter? For me personally, there are quite a few drips on my shelves from storing my winter stews directly in the pot. Also, my dairy drawers are overflowing. The refrigerated dairy aisle is my go-to for so many staples like eggs, yogurts and cheeses so my refrigerator is pretty well-stocked. I like to keep a variety of dairy items on hand because they’re such versatile ingredients that offer endless possibilities in the kitchen. After pulling out everything, scrubbing the shelves, and putting items back in, I scored big. I had 2 opened packages of Philadelphia cream cheese and 2 unopened ones. 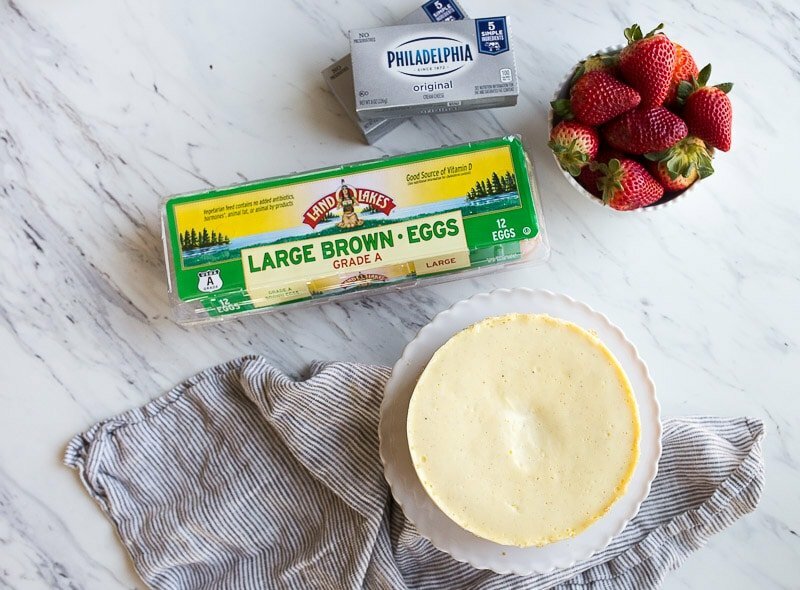 To me, overflowing cream cheese can only mean one thing: cheesecake time! But, I want a non-fussy recipe that’s mostly hands off. Enter: instant pot, stage right. 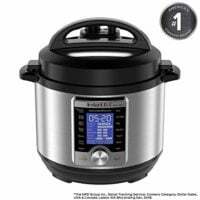 I first began using my instant pot for beans, instant pot chicken stock, and instant pot applesauce, and was quite happy with leaving it at that. But then I became curious about soup, which then led me to discover that you can put frozen chicken breasts in the pot directly! It still shocks me that this is possible. My Instant Pot Butter Chicken became a particular obsession during the winter months. Since then, I’ve been branching out, and we use it for all sorts of things. I try to use it in a new way a few times a month. As the weather heats up, we spend more time outside, which means by the time we get home, I have less than 15 minutes to figure out dinner. I turn to Instant Pot recipes so frequently because I love how few dishes they use (my instant pot mac and cheese is at the top of my list). Also, I love that I don’t have to heat up the house with the oven. 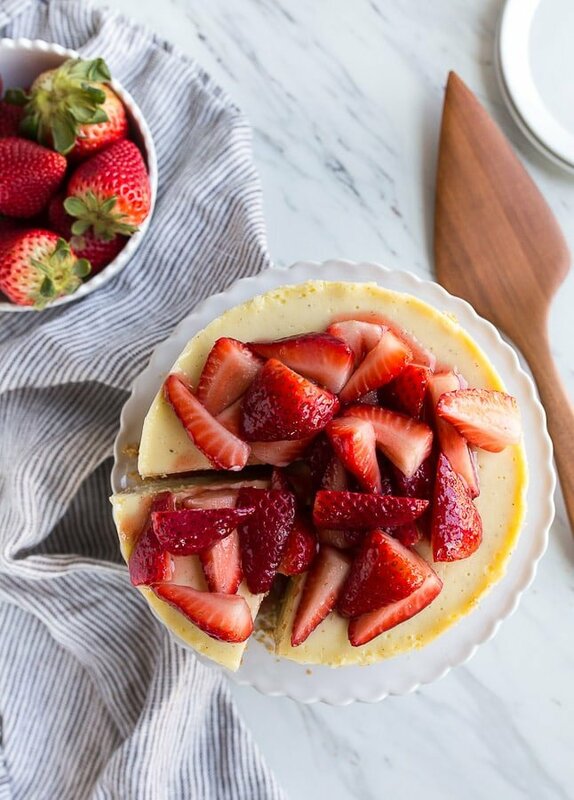 This instant pot cheesecake recipe is a game-changer for me. People often ask me to bring desserts, and this one comes together in less than an hour with super impressive results. 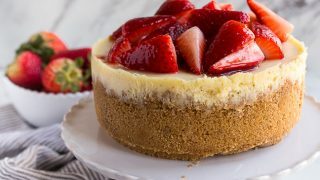 I’m actually a bigger fan of cheesecake cooked in the pressure cooker than the oven, because the sugar takes on a caramelized flavor in the Instant Pot! Speaking of this 6” spring form pan (this link was updated 4/15), it’s the same one I use for my Mini Chocolate Mousse Cake. Please note that it just barely fits inside the Instant Pot. Simply smash your foil down tightly to make it fit, ok? There’s a video to accompany this recipe at the top of the post, because I want you to be confident when baking this recipe. Once you master it, it will quickly become your go-to dessert! And yes, I’ll get to work on a chocolate cheesecake version for you as soon as possible. 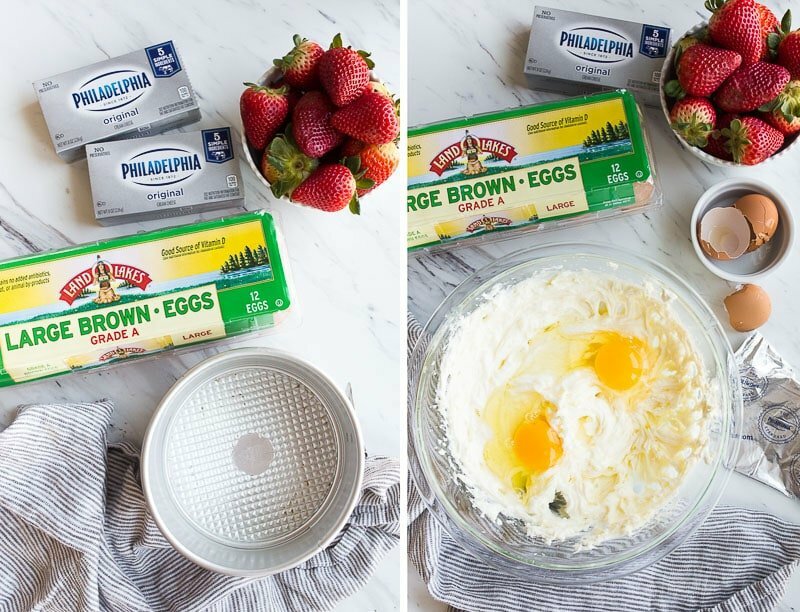 I’m using the cream cheese and eggs that I always have in my fridge: Philadelphia Cream Cheese and Land O Lakes large brown eggs. My toddler discovered cream cheese on my Everything Bagel a few months ago, and now I find her with her fingers in the drawer, eating it straight out of the package. Yikes! 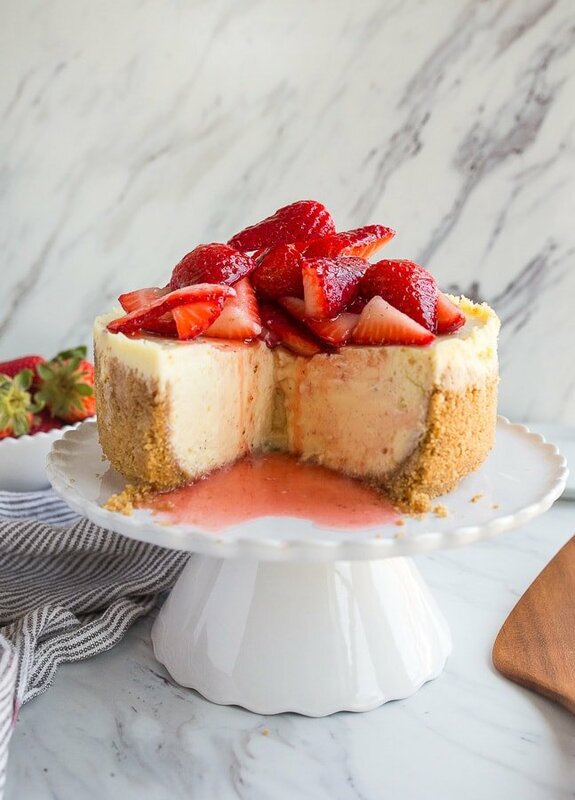 The fresh strawberry topping on this instant pot cheesecake is entirely optional, but I think once you try it, you’ll love it. You can substitute canned pie cherries, blueberries, or any other type of fruit you like on a cheesecake. The cheesecake is great plain, too, because it has a great balance of vanilla bean paste and lemon zest. 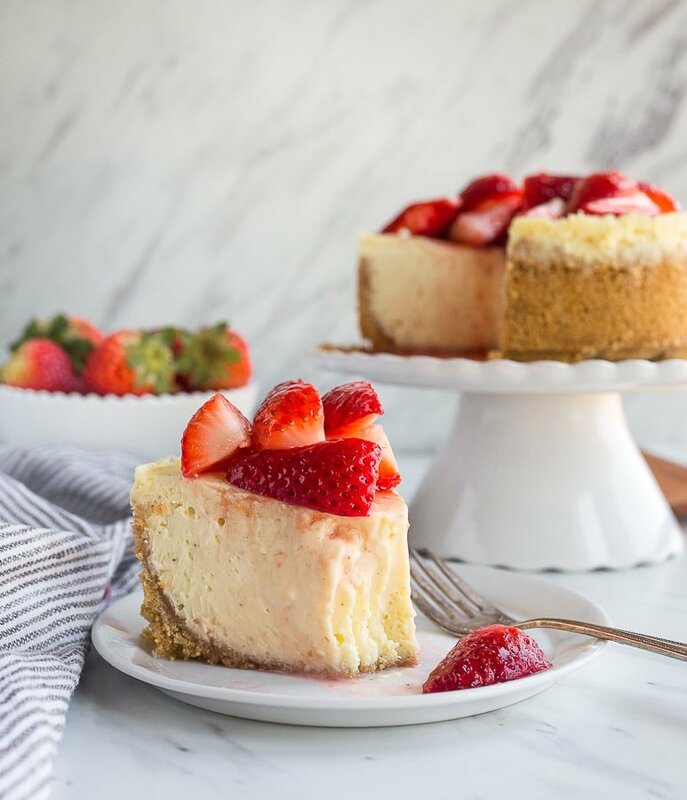 Let me know how this instant pot cheesecake goes for you, and tell me what else you like to make in your instant pot! I use my Instant Pot mini 3-quart machine for this, and mine came with a metal trivet. If you misplaced yours, go ahead and order these with the long handles–it will be so much easier to remove your cheesecake from the instant pot! You really need to bake your cheesecake on top of the trivet. Just in case, we’re still going to line the springform pan with foil. 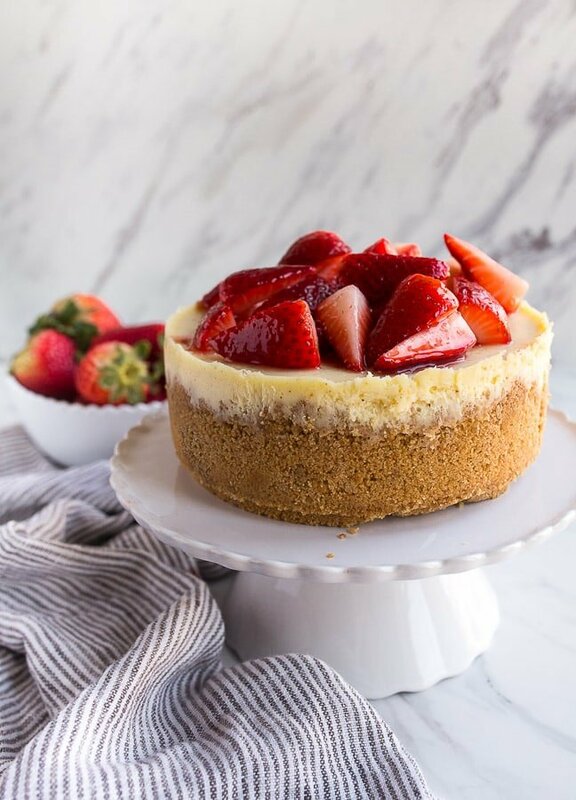 Instant pot cheesecake recipe made in the 3 quart instant pot mini. First, make the crust: pulse the graham cracker sheets in a food processor to crush them. Add the sugar and melted butter, and pulse to combine. Alternatively, if you’re using graham cracker crumbs from the box, stir the crumbs, sugar and melted butter together in a small bowl. Next, brush the oil all over the sides and bottom of a 6x3” springform pan. Press the crumbs into the pan, making a thin layer on the bottom, and bringing the crumbs up the sides of the pan by about an inch or so. Wrap the bottom and sides of the pan in foil, and set aside. Next, make the filling: In a large bowl, add the room temperature cream cheese. Beat with an electric hand mixer for about 15 seconds to break it up. Slowly start streaming in the sugar while beating. Follow it up with the eggs, one at a time. Finally, beat in the vanilla bean paste, lemon zest, and whipping cream just until combined. Don’t over-beat the mixture or you’ll create air bubbles in the batter. 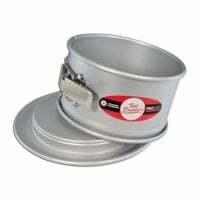 Place the metal trivet in the bottom of your Instant Pot Mini 3-quart machine. Add 1 1/2 cups of water—it should just barely touch the bottom of the trivet. Next, carefully lower the springform pan into the Instant Pot, smoothing the foil around the pan to make it fit. It will be a tight fit! Once the pan is in, pour the cheesecake filling carefully into the pan. It comes above the crust. Lock the lid of the Instant Pot in place, and turn the valve to ‘SEALING.’ Press ‘PRESSURE COOK’ and make sure it’s on HIGH. Enter 27 minutes, and make sure ‘KEEP WARM’ is off. Let the cheesecake pressure cook for 27 minutes, and once the timer goes off, leave it to do a natural pressure release for at least 20 minutes. Let the cheesecake cool in the Instant Pot until it's cool enough for you to lift it out, about an hour. Next, chill the cheesecake in the fridge for at least 8 hours before serving. To make the optional strawberry sauce: Slice the strawberries, and toss with the jam and sugar. When glossy and soft, about 5 minutes later, spoon atop the cheesecake and serve. Please note that I am using an Instant Pot MINI, the 3 quart model. Hi Christina, I’m simply loving all of your “for two” recipes. I just purchased your latest cook book. I use the other three constantly. For Easter I’m making several of your “for two” desserts so we’ll have a nice variety. Can this be baked instead since I’ve yet to purchase an instapot. If so, what temp and for how long? I do have a 6 inch springform pan. Hi Sharon! Thank you so much! It’s nice to meet you :) Thank you for all of your support; I really appreciate you! How lovely to have so many desserts for two for Easter! I ordered the Springform pan that you suggested. This does not fit in the 3 qt. InstantPot. The extra width on the base does not go in. Oh no, Coleen! I’m so sorry. My pan is from Hobby Lobby, and I thought I linked to a comparable one. I will remedy this. I’m so sorry! Just to make sure: do you have the standard stainless steel insert for the IP? Excited to try my new instant pot mini. Want to try your cheesecake recipe for my 3 quart model. Bought the highlighted cheesecake pan you recommended, of course the wide base does not fit in the instant pot. Is there an error in the model of the cheesecake pan you recommended ? Yes, Nancy! I’m so sorry! The pan I use is from the hobby store, and I thought I found an identical match on Facebook. Fixing this now! Dooo you think I could make this in my regular sized instant pot? I do…but I would increase the cooking time by about 10 minutes or so. Made this lat weekend and it tasted wonderful. I had a lot of condensation when I removed it from the instant pot, had to pat it dry. Also I used the fat dadios 6 inch push up cheesecake pan which fits perfectly in my 3 quart IP. Fat Dadio’s website has a chart telling you which pan type will fit into your type of IP.